Author(s): Ira Fink - Ira Fink and Associates, Inc.
Once a university has decided to build, add, or remodel facility space, the single most important predesign aspect is programming the facility. Facility programming is a process to determine and identify the space needs of a potential facility. The facility program is the documented outcome of this space needs process. A very carefully prepared project program helps to ensure project success. This chapter focuses on the significant aspects of facility programming and facility program issues. It draws on the extensive and proven experience of our firm as professional consultants in this area. It is also based on books and articles that others have produced on building programming, as identified in the Bibliography. Surprisingly, the literature of higher education is almost devoid of materials on or about facility programming. As a result, references in this article include both campus and noncampus publications. Campuses should recognize three significant aspects of facility programming. First, facility programming is an information-processing activity. Second, the organizational setting or culture of the campus is the general context both in which programming takes place and in which the boundaries are set. Third, facility programming is more than simply an inventory of needs or a computation of allowed space—it is a process that helps guide and potentially anticipate subsequent steps in facility development. Programming occurs as key project issues, such as budget, scope, and building quality, are being identified. Programming happens early in the building development process, when major form-giving decisions are being made. Programming allows the campus to raise the awareness of campus needs before design begins. Campuses continuously relocate and move activities and organizations, and moving often requires reprogramming, reassigning space, remodeling, and making the space work as efficiently as possible. The process can also result in entirely new buildings and building types. Campuses should view programming as the least expensive time they can spend in the building process. This is because programming is the time when space needs conflict and problems are discovered. It is at this early stage of project development that changes are least expensive to make and issues can and should be resolved. Campuses should consider facility programming as part of a larger family of university predesign efforts. Programming is not an isolated activity, but one that is integrated with other campus planning studies. For example, studies such as site location, space inventory, marketing, and long-range planning all impact facility programming. In addition, programming may generate the need for other specialized studies, such as cost estimating, parking and traffic needs, and site-specific master plans. Campuses should view programming as a framework for setting priorities. Programming allows for comparison of user wants to needs. It can be used to establish budget requirements and, in so doing, establish priorities. Continuous cost estimates during programming provide an important means of matching space needs with available funding. Programming provides a campus with information to make decisions and choices about space. In so doing, programming helps reduce anxiety about a proposed project. Because it is a step-by-step activity, programming reduces guesswork and arbitrary decisions. In this way, programming assists in tailoring the unique space needs of a project to overall university facility needs. Because it is a process, programming provides a systematic way of assessing and evaluating need. Programming provides a university the opportunity to verify, to change, and to add or reduce the space needs scope of a proposed project before design begins. As such, programming helps identify where campus resources (money, space, land) should be allocated. It also assists in analyzing, evaluating, and looking for conflicts among needs. In addition to identifying conflicts, programming is useful in prioritizing needs so that the project stays within the budget. Thus the building committee and university executives will understand that the end result may not have everything as originally anticipated. Because it is a stepwise process, programming can promote agreement about the major project parameters before design alternatives are produced. In this way, potential areas of disagreement are identified, addressed, and resolved. Upon completion, the program can become part of the "contract" between a campus and its outside architects and design professionals. Many issues can comprise a building program or a building that was designed and built without a proper program. Some of these issues include: building a wish list; leaving out needed spaces; not accounting for non-assignable space; designing before programming is complete; lack of knowledge of the building type; not listening during programming interviews; not allocating space impartially; creating the wrong size rooms and spaces; inability to visualize the size of a space when built; not knowing how the building is to work or how buildings are built; failure to prioritize the building needs; failing to estimate the project cost during programming. These issues can be overcome and need to be avoided when programming. Early in the development of a facility program for a project, certain known needs or spaces act as the form or shape givers for the subsequent building project. These form givers can have many shapes: They can be either large or unique spaces, repetitive spaces, or linkages to other projects. These form givers can also be identified by their size, scale, special needs, or required location. Think, for example, of the form given to a building by the size and volume of a basketball court or a theater, or the exterior design established by offices having natural light and windows. A facility program provides guidance to the user (owner) and instructions to the design architect. A facility program is a unique recipe for a building, which describes and quantifies its spatial components. A program is not a building design. It defines issues. It presents concepts. It describes strategies for accommodating space needs. A campus facility program should distill and present relevant information about the project. The program lists area requirements by name, by function, by size, by environmental and comfort level, and by number of occupants or users. The space needs program can also identify important management and operational activities required upon facility completion. The program can provide a baseline measure and an opportunity to use the results of a post-occupancy evaluation of similar buildings, remembering that existing or similar situations can be a major source of information during design. The program can also provide background narrative about what was proposed and what was concluded to be necessary. A facility program should document conclusions reached by the campus about space needs. The program presents these conditions, as they are relevant to design decisions, to meet specific user requirements. The program can also map out future conditions, including expected growth or change. Because it provides information, the program outlines specific directions and proposed actions, such as phasing. It describes results to be achieved. A sample of program planning assumptions for a recreation facility is shown in Figure 1. The university does not want to delay moving forward with the recreation facility. It would be desirable to place the recreation facility, the outdoor play fields, and the outdoor pool all in one location. However, if this is not possible, the play fields could be placed in decentralized locations. The outdoor pool is not to include recreational diving. The university wants the recreational facility to create the basis for a resurgence in the area south of campus. The recreation facility budget is to cover a “basic” facility. The recreation facility should be sited where it best meets the long-term interests of the university. One city block would be needed to construct the recreation facility and the outdoor pool; approximately one and one-half city blocks would be needed for the outdoor courts, including tennis, volleyball, basketball, and play fields. If the recreation facility is placed south of campus, an overpass would have to be constructed. Because of the commercial use south of campus, the orientation and entrance of the building become important design criteria. As a planning objective, the university wants to avoid displacing existing university land uses. Source: Ira Fink and Associates, Inc. This brief statement of planning assumptions for a proposed recreation facility tells the designer much about the university’s intent to have a basic facility, to use up to one and one-half blocks of land, and to move forward quickly without displacing users from an already occupied site. Facility programs describe and analyze user organizations, answering questions such as How big? How many? Who is involved? Who are the users? Who are the clients? Who are the service providers? A facility program documents the analysis of user needs. In other words, what will allow this facility to best meet the needs of this group? Facility programs can identify code requirements, estimate construction and project budgets to meet project needs, and present schedules for completion of the work. Another important component of the facility program is the identification of specific building systems, including environmental conditions, lighting, security, and their controls. If LEED certification is desired, it is also critical to have a LEED practitioner on the building committee to effectively identify building systems and their functions, cost, and contributing value to LEED certification. The overriding issue affecting campuses in programming is to understand and balance the relationship between budget, scope, and quality. 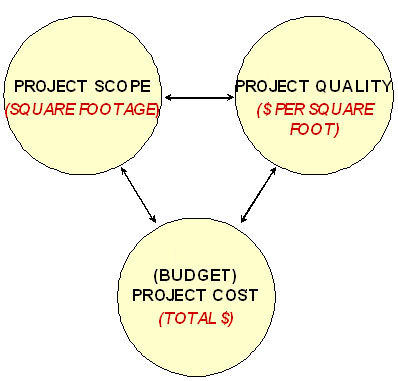 Budget or project cost is the total amount available for the project. Project scope is the quantity or the summation of all proposed project areas as measured in gross square feet. Project quality is the estimated cost to construct the building using an approximation measured in dollars per square foot and based on building materials, finishes, and means of construction. If any two of these three items—budget, scope, or quality—are fixed, the third item is automatically determined. For example, when project cost (measured in dollars) is divided by project scope (measured in square feet), the result is project quality (or dollars per square foot needed to construct the project). Important issues in facility programming are the trade-offs among available site size, interior space and contained activities, project scheduling, and project budget. One purpose of the programming activity is to test the major project needs, then refine and recycle them until they are in balance in terms of project budget, scope, and quality. Building functional requirements are at the heart of the facilities program. The program must describe the activities to be housed and define occupancy, both by code and by user. Space needs unique to the project can cover flexibility, growth and change, environmental requirements, image, and other trends. Identified campus technical requirements and technical standards for buildings are also an area of concern. The program needs to identify proposed building systems if the campus has a systems standard or a systems vendor, such as alarm systems. Code requirements for selected occupancy are an important component of the program, as are personal safety and building security. A related area is to identify known campus policy standards for facilities. They could include design or area standards, such as maximum square footage for offices, as well as utilization requirements, including hours of occupancy and rate of utilization. There may also be campus standards on material finishes and room furnishings. If there are campus building planning guidelines, such as space requirements, "Design Guidelines," or "Construction Standards," these also should be covered. Access/egress points and accommodation of disabled persons need to be covered. 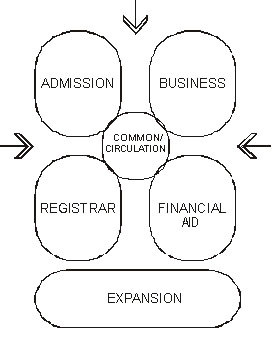 These program elements relate to building circulation systems, the location of entrances/exits, the number of floors or stories, and enclosed/open spaces. ADA compliance and addressing the special needs of all people is not confined to just physical access, but also includes access to information in a less isolating and obvious way. For example, assistive listening devices might be considered so that they are incorporated into the building along with other communication systems. Due to the continuing emphasis on energy efficiency and sustainability, several additional analyses may be undertaken during programming. These might involve the location of mechanical equipment, alternative energy production, building orientation, and how the outdoor environment impacts building users energy consumption, daylighting and outdoor learning/teaching spaces. Other needs important to a building program should also be considered. Not all facility needs are space related, as shown in the housing program example in Figure 3. This figure lists the important features identified by students in selecting a place to live. The features, ranked by their importance, reveal that factors outside of the immediate space being programmed need to be taken into consideration, such as economic and social requirements. As this list illustrates, it is not the design of the residential facility, but the ability to meet privacy criteria with regard to sleeping, being alone, and studying, which are at the top of what students look for in their housing. Programming should be a systematic process. It needs to ensure that to the greatest degree possible, everyone who could or should influence the project is contacted, either through service on a building committee, through individual interviews, by survey, or by invitation to participate in workshops or group meetings. The program should provide written evidence of decisions, agreements, and consensus reached during the process. Programming can provide everyone connected with the project the opportunity to change their minds. At some campuses, for example the University of California and the University of Texas, programming is a highly organized and structured activity. Staff at these institutions know they are working for very large public corporations with guidance on how to do almost everything, including programming. Likewise, the programmers need to know where they stand at all times and where they are in the process. They need to know what they need to do to perform and that at different points in the process they will be working with many people because numerous individuals will have input into the programming process. There are various ways to go about programming a project. The user or university may start with wish lists, lists of unmet needs, and lists of frustrating aspects of current conditions. Keeping clippings or files of materials about similar projects is also a useful aid in programming. If funds are available, site visits to other similar projects can help users visualize what they may or may not want or need. If this is not possible, notes of visits to other facilities by a Web search are useful. If the project program cannot be done internally, then the campus should contract with outside consultants or design professionals. There are often specialists in specific building types. These individuals or firms may be able to resolve potential internal campus conflicts about a project thanks to their breadth of knowledge. The campus should choose a consultant who is objective and responsive, and who does not have a vested interest in the project. What does it cost to hire a consultant to program? A good rule of thumb is that programming should cost about 1 percent of project cost and save the project even more. This cost is saved by a more efficient building that meets user needs, eliminates unneeded or duplicative space, identifies all needed space, and helps with an earlier start of the design process. Establish a user (building) committee. Determine the functional needs of the project. Determine growth patterns as exactly as possible. Translate functional needs into planning guidelines. Identify occupying units, functions, and support facilities. Determine general and specific space requirements for each. Diagram building component sizes and shapes (including height, width, and bulk). Prepare specific room data sheets for each individual and distinct space. Assist the User Committee in preparing the project documentation. Each of these steps is further discussed below. As noted in the following discussion, there is a degree of overlap among certain steps. Moreover, some of them can and should be done simultaneously, rather than in a linear fashion, to allow for interaction among the steps and to gain relevant feedback. Most of the steps have a defined product that is also identified below. The programming process should begin with the appointment of a program planning or oversight committee. For academic facilities, this committee can include faculty and other users representing the programs involved, representative(s) from other departments, and representatives of the dean's office and student leaders, as well as campus planning and budget staff and campus architects and engineers. The program planning committee is charged with preparing a project program. It begins by examining the underlying academic or other program needs and current and projected numbers of students, faculty, and staff. As a rule of thumb, it is good to project this population-driven need for space to a target year following expected project occupancy, with generally at least two years following estimated completion of the building as a good starting point. The committee begins by asking questions. What is the campus doing academically today, what do we need to be doing, what are we going to be doing a few years from now? What are our projections of undergraduate students, graduate students? What problems do we have with existing facilities? What are the alternatives to this renovation or proposed new building? What happens if we do not do this project? What changes are occurring in pedagogy? All of these questions should eventually be asked by campus staff, staff from potential funding agencies, or external consultants. Product: Written analysis of campus documents. The context for the facility program is the campus organization for the project. If the following are available, they should be identified or referenced. If these background materials are not available, a list of planning assumptions that will serve as the basis for the program should be developed and agreed upon. Relationships between disciplines or activities. Is this a single-user building or a multiuser building? Product: Preliminary listing of project functional needs. Internal environments that allow the users to best carry out their activities. This could include privacy, shared meeting spaces, etc. Interviews of users and service providers, occupant staff, and operational staff are the cornerstone of this information gathering. A series of interviews with deans, directors, department heads, and decision makers is important, in addition to in-depth interviews, working sessions, and continuous conversations with the proposed users. Interview persons presently connected with the project. Interview others who may have an interest in the proposed project, especially students. Prepare a preliminary estimate of functional requirements for the project in conjunction with the building committee. Determine facility needs by phases of facility construction. Figure 4 is a sample list of typical interview questions. What does your activity do? What type of space does it use? What is the purpose of this function/space? What do you want to accomplish in this space? Who and how many will use this space? What kinds of activities will occur in this space? What separate spaces are required to make up the completed space needed to fulfill this function? Describe the need, if any, for privacy and security for each space associated with this function. What scheduling alternatives must be planned for? What materials and equipment is used or must be stored? What permanent equipment will be housed in the space(s)? Are there any other factors that may influence the design solution? If a function is presently being performed, about how much square footage does it occupy and where is it located? What are the strengths and weaknesses of existing space? Describe the critical relationships to other functions/spaces (people, information, and materials). Product: Written and graphic analysis of relationships. Buildings do not stand alone. They are linked or tethered to other campus activities, including support needs such as safety, security, maintenance, delivery, and communication links. There are often other related campus requirements that need to be considered if new space is added. These requirements could pertain to site improvements, utilities, communications, system capacity and location, and the capabilities of these systems to serve the project. Linkages to other programs and their location on the campus need to be identified. Examine relationships between facilities by preparing utilization diagrams for each major space. Determine the capability of shared spaces for various uses in both the initial and future phases of the project. Describe relationships that might exist between locations of facilities and access points. Prepare a simple "bubble" diagram of space adjacencies. Alert campus to special needs for safety, security, management, entry and exit, control, operation, and administration. Figures 5 and 6 show two types of space relationship diagrams. Figure 5 is for a rural science research laboratory building. This diagram shows both the adjacency of the major exterior to interior areas of the proposed project, and the flow of materials. Figure 6 is for a small college administration building. Product: Refinement of preliminary program needs and preliminary space needs. Because programs change and evolve, space should be flexible to meet these changes. It is useful to consider meeting future needs as well as solving unmet current needs. Carefully review university enrollments, by campus, for the immediate past three years and the projected next 10 years. List facility components of both fixed and variable size that should occur in particular phases of the project. Refine phases of facility construction. Product: Statement of planning guidelines. Many universities, like Auburn University and Stanford University, have developed and published space and design guidelines that illustrate how much area can be devoted to certain types of space, and that provide guidance on and allowances for office furniture and furnishings. The following need to be included in the program. Define room size dimensions for activities that have clearly defined sizes. Define optimal areas consistent with campus program needs and enrollment projections for areas that are more flexible in configuration. With the significance of building and environmental sustainability, including LEED, the performance criteria for the building should also be covered. For example, issues of energy conservation as a component of the building need to be identified. Moreover, the potential disruption of adjacent users, during construction and after occupancy, such as fume hood exhaust or the location of a trash collector, needs to be mentioned. The impact of construction noise on existing users and adjacent uses and users should also be identified, along with other opportunities to improve the sustainability of the project over time. Finally, life cycle costs of building operations need to be addressed. Product: List of occupying units. Identify activities for which space is needed. Provide a distinct name for each required room or space. Develop an estimate of net assignable square footage (NASF) for each space or room based on population and enrollment information. Summarize these needs by major user and occupancy group. Identify general area requirements for nonassignable spaces. Estimate total building area (GSF). 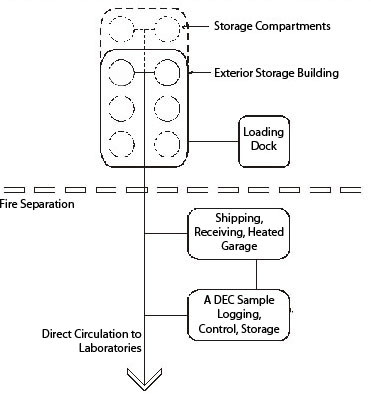 Figure 7 shows one page of a completed facility program. 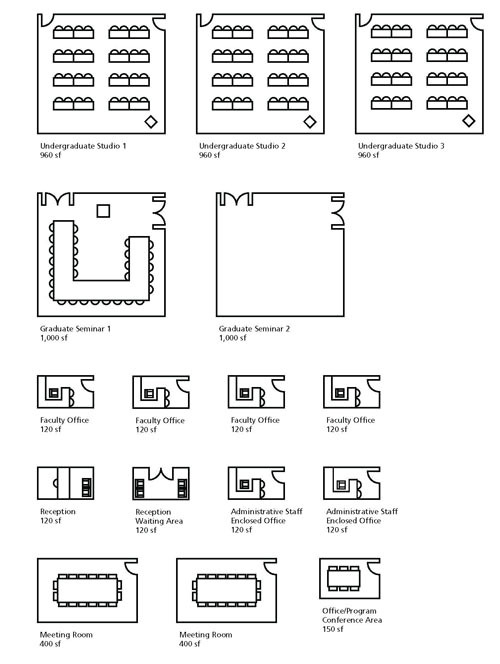 Product: Building facility space diagrams. Because it is often easier to understand the components of a facility program in graphic format, it is useful to create diagrams. These need not be elaborate, although they often are, even including suggested furniture layouts. Figure 8 shows an example of a simple set of room space blocks. As this example illustrates, the components of the facility program are approximately to scale and show the number of repetitions of each space type. Provide block diagrams of other spaces to show gross area. 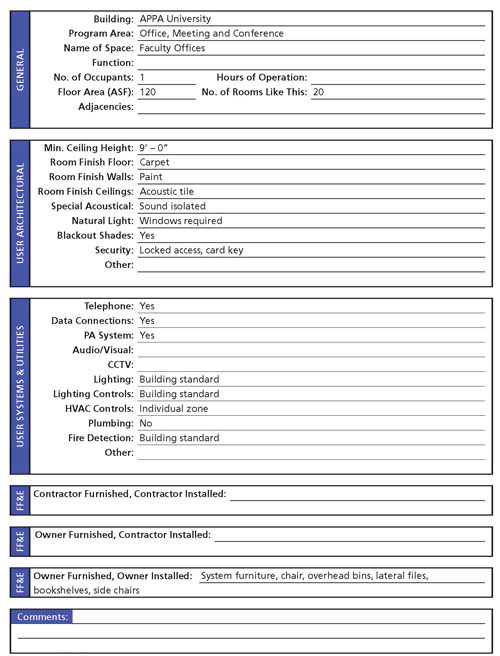 Room or space data sheets are important components of a facility program because they provide a unique way to communicate baseline information about every space in a building program. The data sheets contain information that could influence the design of the facilities as classified by architectural, systems, and furniture criteria. Architectural criteria include ceiling height of rooms; floor, wall, and ceiling finishes; special acoustical needs; special lighting; security; lecture capture and webcam technology; and other. Systems controls include telephone; data; computer; audiovisual; electrical; HVAC; plumbing; fire protection; and other. Furniture criteria include fixed equipment; loose equipment; and miscellaneous equipment, installed by either the contractor or the owner. List minimum ceiling heights where applicable. Note any special floor, wall, or ceiling conditions. Note any special storage or equipment needs related to the activity. Figure 9 shows a sample room data sheet with these items. A preliminary room data form for each of the major spaces defined in the program should be completed. Augment the standard room data sheets in those areas where special products, materials, or space needs that are not covered on the form should be used. These forms should be prepared in concert with the users and the campus facilities office. They should be widely circulated in draft form for review and comment. In addition to assembling the products of the steps above, the product, or facility program, has many components. First is an executive summary so that a person on the periphery of the proposed project does not have to read the detail. The summary is followed by specific campus planning and building needs. Where is this building to be located within the overall campus? What are the constraints on that particular site? What are some of the design guidelines on that site? Next is the technical detail on the individual spaces, room by room. Illustrations showing roughly what furniture is going to be in the room, and any special constraints in terms of heating or ventilation or other building systems can be used to identify needs. The program can also include an outline specification that has more technical detail as to the component means and materials of construction. It can include a cost model that looks at all aspects of construction. Is this going to be an articulated building that is expected to have a very articulated perimeter and outside walls, or will it be a very compact building? It may be important also to program outdoor spaces. In short, it is important to prepare a thorough final report so that the user committee can extract large portions of it directly into the project documentation, and those responsible for approval and funding can have a complete overview of the proposed project. If a consultant has worked on the project, the consultant should assist the user committee in documenting the need for a facility that will be architecturally delightful, as well as functional and economical. Often, facility programs contain a sign-off sheet providing signature space for those who have to approve the project. Scheduling activities are often organized and managed by a project manager, who in addition to keeping the project on schedule, is also responsible for keeping the building committee informed. As is apparent from this chapter, the most basic skill of the programmer is the ability to communicate. This means communication both from user to programmer and from programmer to decision maker. Communication is the ability to listen and hear, as well as to transmit information in all forms: orally, textually, and graphically. Because programming is a form of information processing, communication begins with the ability to separate wishes from true needs. Empathy is often missing among design professionals who are problem solvers, and environmental determinists who may believe they know more than the building user, operator, or owner. When this occurs, the product can become what the programmer believes the users want, rather than what the users themselves want. To overcome wishful hearing the programmer must understand the importance of presenting results in a usable format. This requires more than the technical knowledge of buildings and construction. It requires a willingness to listen carefully, be thorough, communicate clearly, and remain objective. One key to ensure that the program is complete is to build into this process sufficient time for review of documents necessary to reach concurrence. This includes spending the time to go step by step through the document, in draft form, with the user, the owner, and the building committee to be sure it is understood. Programming is an ongoing process: Programming continues until demolition. It is both a fixed process and a fluid process. Accountability and responsibility are part of programming. Results require firm programs and reliable budgets. Budgets, codes, policy guidelines, and standards are key form givers that are often overlooked in programming. Constraints help the programming/design process. Technology in the institutional instructional environment requires more space than conventional instructional space. It is important to know how a campus operates 24 hours a day, 7 days a week. Program results can vary by level of openness vs. entrenchment of users. It is important to keep a record of deliberations and conclusions. Program changes, even late in the process, are welcomed. Every change in organizational structure leads to a change in space. A facility program is a unique recipe for a building that describes and quantifies its spatial components. A program is not a building design. It defines issues. It presents concepts. It describes strategies for accommodating space needs. In conclusion, universities should recognize that programming is a significant predesign activity. When done well, the product of programming, the program, should save, rather than cost, a campus. When programming a variety of campus building types, it is important to recognize that steps in a process are general, but each building type has characteristics that need to be factored into the process. This appendix lists of some of the distinctions that occur across four types of projects: science buildings, recreation facilities, housing, and theaters. Distinctions among these as classified by client, users, project costs, building features and form givers, major project parameters, and other concerns are listed. This spelling out of differences among these building types should assist the new programmer in getting ready to program and being ready to adapt to the circumstances of each type of building and its program. As noted in the introduction, not much has been written about programming university facilities. Books on specific types of facilities are common and cover many distinct building types. Buildings on the programming process are less common, but nonetheless exist. As the following reference list illustrates, many of the books on and about programming have their genesis in behavioral studies and environmental studies. It is important to understand this as one goes about the process of facility programming and developing a facility program. Since buildings enclose activities and people, it is key to understand the space needs associated with each. The Architects Guide to Facility Programming. Mickey A. Palmer. Washington, DC: The American Institute of Architects and Architectural Record, 1981, 293 pp. Architectural Environment and our Mental Health. Clifford B. Moller. New York: Horizon Press, 1968, 159 pp. Architectural Programming: Creative Techniques for Design Professionals. Robert R. Kumlin. New York: McGraw-Hill, Inc., 1995, 250 pp. Architectural Programming: Information Management for Design. Donna P. Duerk. New York: Van Nostrand Reinhold, 1993, 258 pp. Architectural Programming and Predesign Manager. Robert Hershberger. New York: McGraw-Hill, 1999, 506 pp. Architectural Psychology: Proceedings of the Lund Conference. Edited by Rikard Kuller. Stroudsburg, PA: Dowden, Hutchinson & Ross, Inc., 1973, 450 pp. Architecture and Social Behavior: Psychological Studies of Social Density. Andrew Baum, Stuart Valins. Hillsdale, NJ: Lawrence Erlbaum Associates, 1977, 110 pp. The Behavioral Basis of Design, Book 1: Session Summaries and Papers. (ERDA7) Peter Suefeld and James A. Russell, editors. New York: McGraw-Hill Publishers, 1976, 381 pp. The Behavioral Basis of Design, Book 2: Session Summaries and Papers. (ERDA7) Peter Suefeld, James A. Russell, Lawrence M. Ward, Francoise Szigeti, and Gerald Davis. New York: McGraw-Hill Publishers, 1977, 343 pp. Behavioral Architecture. Toward An Accountable Design Process. Clovis Heimsath. New York: McGraw-Hill Book Company, 1977, 203 pp. Behavioral Research Methods in Environmental Design. William Michelson, Editor. Stroudsburg, PA: Hutchinson Ross Publishing Company, 1975, 307 pp. A Bibliography of Information for Facility Planning for Special Education. Prepared by Sub-Committee on Special Education of the Committee on Architecture for Education of the American Institute of Architects. Washington, DC, 1975, 85 pp. Building for People: Behavioral Research Approaches and Directions. Arthur I. Rubin and Jacqueline Elder. Washington, DC: U.S. Department of Commerce, 1980, 306 pp. Buildings and Society. Essays on the Social Development of the Built Environment. Edited by Anthony D. King. London: Routledge & Kegan Paul, 1980, 318 pp. Building Design and Human Performance. Edited by N.C. Ruck. New York: Van Nostrand Reinhold, 1989, 284 pp. Community Participation Methods in Design and Planning. Henry Sanoff. New York: John Wiley & Sons, Inc., 2000, 306 pp. Conceptual Blockbusting: A Guide to Better Ideas, Second Edition. James L. Adams. New York: W.W. Norton and Company, 1979, 153 pp. Connective Planning. Morris D. Verger and Norman Kaderlan. New York: McGraw-Hill, Inc., 1994, 270 pp. Creative Architectural Theory: The Role of the Behavioral Sciences in Environmental Design. Jon Lang. New York: Van Nostrand Reinhold Company, 1987, 278 pp. Creative Design Decisions. Stephen J. Kirk, Kent F. Spreckelmeyer. New York: Van Nostrand Reinhold Company Inc., 1988, 282 pp. Crowding and Behavior. Jonathan L. Freedman. San Francisco, CA: W.H. Freeman and Company, 1975, 177 pp. Design for Human Affairs. C.M. Deasy. New York: John Wiley and Sons, 1974, 183 pp. Design for Research: Principles of Laboratory Architecture. Susan Braybrooke, Editor. New York: John Wiley and Sons, 1986, 193 pp. Design in Architecture: Architecture and the Human Sciences. Geoffrey Broadbent. London, New York, Sydney, Toronto: John Wiley & Sons, 1973, 504 pp. Design Intervention. Toward a More Humane Architecture. Edited by Wolfgang F.E. Preiser, Jacqueline C. Vischer, Edward T. White. New York: Van Nostrand Reinhold, 1991, 374 pp. Design Methods in Architecture. Geoffrey Broadbent and Anthony Ward. Architectural Association Paper Number 4. London: Lund Humphries for the Architectural Association, 1969, 204 pp. Design Methods: Seeds of Human Futures. J. Christopher Jones. London: Wiley Interscience, a division of John Wiley & Sons, 1970, 407 pp. Designing for Human Behavior. Jon Lang, Charles Burnette, Walter Moleski, David Vachon. Stroudsburg, PA: Dowden, Hutchinson and Ross, Inc., 1974, 353 pp. Designing for People. Henry Dreyfuss. New York: The Viking Press, 1955, 230 pp. Designing Places for People. A Handbook on Human Behavior for Architects, Designers, and Facility Managers. C.M. Deasy, FAIA. New York: Whitney Library of Design, 1985, 141 pp. Developments in Design Methodology. Edited by Nigel Cross. Bath, Avon, England: John Wiley & Sons Ltd., 1984, 357 pp. Emerging Concepts in Urban Space Design. Geoffrey Broadbent. London: Van Nostrand (International), 1990, 380 pp. Emerging Methods in Environmental Design and Planning. Gary T. Moore, editor. Cambridge, MA: MIT Press, 1970, 410 pp. Emerging Techniques of Architectural Practice. C. Herbert Wheeler et al. Washington, DC: The American Institute of Architects, 1969, 92 pp. Emerging Techniques - 2: Architectural Programming. Benjamin H. Evans and C. Herbert Wheeler, et al. Washington, DC: The American Institute of Architects, 1966, 70 pp. Enclosing Behavior. Robert Bechtel. Stroudsburg, PA: Dowden, Hutchinson, and Ross, 1977. Environment and Behavior. Volume 14, Number 6. Gary T. Moore, Editor. Beverly Hills, CA: Sage Publications, 1982. Environmental Design Evaluation. Arnold Friedmann, Craig Zimring, Ervin Zube. New York: Plenum Press, 1978, 225 pp. Environmental Knowing: Theories, Research, and Methods. Edited by Gary T. Moore, Reginald G. Golledge. Stroudsburg, PA: Dowden, Hutchinson & Ross, Inc., 1976, 441 pp. Facilities Manual. University of California, Facilities Administration. http://www.ucop.edu/facil/fmc/facilman/ (accessed 5/29/09). Facilities Programming Guidelines. University of Texas System, Office of Facility Planning and Construction. Austin, 1995, 102 pp. Facility Programming. Wolfgang F.E. Preiser, Editor. Stroudsburg, PA: Dowden, Hutchinson & Ross, Inc., 1978, 340 pp. Facility Design. Stephan Konz. New York: John Wiley & Sons, Inc., 1985, 368 pp. Graphic Problem Solving for Architects and Builders. Paul Laseau. Boston, MA: CBI Publishing Company, Inc., 1975, 159 pp. A Graphic Survey of Perception and Behavior for the Design Professions. Forrest Wilson. New York: Van Nostrand Reinhold Company, 1984, 298 pp. A Guide to Conducting Healthcare Facility Visits. Craig Zimring, Ph.D. Martinez, CA: The Center for Health Design, Inc., 1994, 74 pp. plus supplement. High-Technology Workplaces. Edited by Pierre Goumain. New York: Van Nostrand Reinhold, 1989, 354 pp. How Designers Think. Bryan Lawson. London: The Architectural Press Ltd, 1980, 216 pp. Inquiry by Design. Tools for Environment-Behavior Research. John Zeisel. Monterey, CA: Brooks/Cole Publishing Company, 1981, 250 pp. Introduction to Architectural Programming. Edward T. White. Tucson, Arizona: Architectural Media, Ltd., 1972, 84 pp. Methods in Environmental and Behavioral Research. Edited by Robert B. Bechtel, Robert W. Marans, and William Michelson. New York: Van Nostrand Reinhold, 1987, 415 pp. Methods of Architectural Programming. Henry Sanoff. Stroudsburg, PA: Dowden, Hutchinson and Ross, Inc., 1977, 184 pp. People and Buildings. Edited by Robert Gutman. New York: Basic Books, Inc., Publishers, 1972, 471 pp. People Places: Design Guidelines for Urban Open Space. Edited by Clare Cooper Marcus, Carolyn Francis. New York: Van Nostrand Reinhold, 1990, 295 pp. Personal Space, The Behavioral Basis of Design. Robert Sommer. Upper Saddle River, NJ: Prentice-Hall, Inc., 1969, 174 pp. The Planner's Use of Information. Edited by Hemalata C. Dandekar. Stroudsburg, Stroudsburg, PA: Hutchinson Ross Publishing Company, 1982, 224 pp. Post-Occupancy Evaluation. Wolfgang F.E. Preiser, Harvey Z. Rabinowitz, Edward T. White. New York: Van Nostrand Reinhold Company, 1988, 198 pp. Principles of Design in Architecture. K. W. Smithies. New York: Van Nostrand Reinhold Co., Ltd., 1981, 87 pp. Problem Seeking: An Architectural Programming Primer. William Pena, William Caudill, and John Focke. Boston, MA: Cahners Books International, Inc., 1977, 202 pp. Professional Practice in Facility Programming. Wolfgang F.E. Preiser. New York: Van Nostrand Reinhold, 1993, 541 pp. Programming for Design: From Theory to Practice. Edith Cherry. New York: John Wiley & Sons, Inc., 1999, 327 pp. Programming the Built Environment. Wolfgang F.E. Preiser. New York: Van Nostrand Reinhold Company Limited, 1985, 166 pp. Psychology and the Built Environment. Edited by David Canter and Terence Lee. New York: John Wiley & Sons, 1974, 213 pp. Psychology for Architects. David Canter. London: Applied Science Publishers, Ltd., 1974, 171 pp. Psychology of Architectural Design. Omer Akin. London: Pion Limited, 1986, 196 pp. Social Design: Creating Buildings with People in Mind. Robert Sommer. Englewood Cliffs, NJ: Prentice-Hall, Inc. 1983, 198 pp. The Social Logic of Space. Bill Hillier, Julienne Hanson. Cambridge, England: Cambridge University Press, 1984, 281 pp. Space Operational Analysis: A Systematic Approach to Spatial Analysis and Programming. Manuel Marti, Jr. West Lafayette, IN: PDA Publishers Corp., 1981, 214 pp. Spaces for People, Human Factors in Design. Corwin Bennett. Upper Saddle River, NJ: Prentice-Hall, Inc., 1977. User Participation in Building Design and Management. David Kernohan, John Gray, John Daish, with Duncan Joiner. Oxford, England: Butterworth Architecture, An imprint of Butterworth-Heinemann, Ltd., 1992, 157 pp.